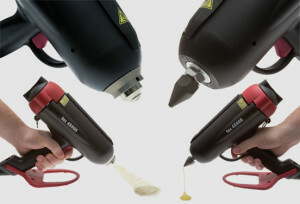 Bring out the BIG GUNS for when you need molten glue fast, on demand or for continuous gluing. Tec 3400 power 43mm glue gun which features a clever trigger boost system that increases power when the trigger is pulled, upping the output even more. More powerful, more reliable than the Tec 3200. Tec 3400 is a glue gun for consistent and quality bonding. Tec 4500 Bead or Spray glue guns are highly versatile for applying a wide variety of bulk (Granular, Pillows, Slats) and shaped (43mm) hot melt adhesives. 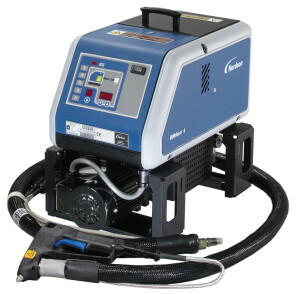 Now you can apply a FULL pressure sensitive adhesives via a Tec glue gun and these Tec 4500 glue guns will dispense most other forms of bulk hot melt adhesives. 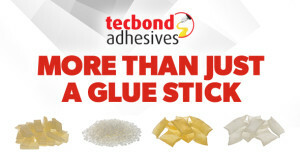 We can offer any of our standard Tecbond glue sticks in a bulk format plus a range of EVA, polyolefin, pressure sensitive (PSA ) and polyamide adhesives covering off many applications from Packaging to Product Assembly, have a gluing problem, don’t come unstuck, talk to the glue experts. Tecbond BULK adhesives can be used in the Tec 4500 glue guns or applied via a Norsdon bulk tank system, which are available in 4 litre, 10 litre and 16 litre versions. Can be used with one or two hoses, bead or spray.